Microscope objectives are corrected for field curvature and color aberration. The difference between an Achromat and a Plan Achromat microscope objective lens is the degree of the flatness of field. Because an achromat microscope objective does not have a correction for the curvature of the lens, the very outer edges of the circular image you view through the microscope will be just slightly out of focus. In a Plan Achromat microscope objective lens, this curvature of lens has been corrected and should result in a crisp clear in-focus image from one side of the circular image to the other. We decided to test out the National Optical model 162 biological microscope, which can be purchased with either Achromat or Plan Achromat lenses. 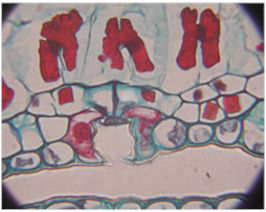 This is a pine needle cross section as seen with the Achromat objectives from the National 162 microscope. 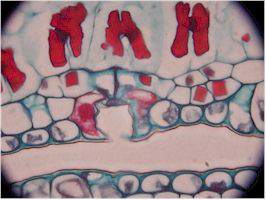 This is the same pine needle cross section, using the Plan Achromat objectives from the National 162 microscope. When looking at the two images, it is a bit hard to recognize a large difference between the Achromat and Plan Achromat lenses. On this particular model of microscope (a high school microscope), our recommendation would be to save money and simply purchase the Achromat lenses. Some of the higher end microscope models have a more distinct difference between the Achromat and Plan Achromat objectives. Especially when using 1000x magnification and looking for micron size particles, the Plan Achromat objectives are preferred and reveal a superior image over the Achromat lenses. Plan Achromat lenses have an image that is in focus from the center towards its edges and the field is said to be "flat". In general, the flatter the field of an objective, the more lenses it contains and the more expensive the cost.